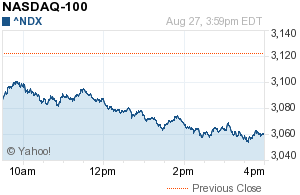 The market simply got pounded today after reports that NATO forces might be close to striking Syria. The NDX 100 closed with a loss of 2.02 % as an involvement in any military action will hurt our fragile economy thus halting what has been an already sluggish economic recovery. The news sent WTI Oil on a rally closing at 108.80 as an additional conflict in the area could further disrupt oil supplies. An increase in Oil prices will act as an extra tax on US consumers at a moment when an increase in consumption is needed in order to bolster employment.